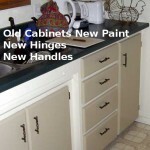 Some of the more obvious ideas for remodeling a kitchen or bathroom that has old cabinets would be painting or changing the hinges, handles or knobs. There are many options that are affordable and somewhat easy to do yourself (DYI). Different techniques are used for Formica kitchen cabinets in comparison to real wood. There are many popular kitchen cabinet additions that can be included in your renovation project. 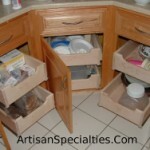 Older kitchens have outdated hinges and usually were not built with metal drawer slides. Another thing we sometimes encounter is the structural way the cabinets were built will not always allow for newer hardware to be used on the older parts, at least without a lot of work. The bottom line is that replacement parts are hard to find and the chances are not good that new hardware will work. Finding older cabinet hinges is near impossible. If you have a Habitat For Humanity warehouse near you, I would suggest starting there. The problem we encounter when we just want to fix broken hinges is that they are not available. If the cupboard doors were prepared especially for that style hinge with a particular notch or groove, it’s not likely that you will find a modern hinge to match the slots on the cabinet door. In such cases you should plan on replacing all of the doors and hinges with new ones. Most of the real old kitchens were built right on the job site. During a certain time period the drawers were built to ride on wooden rails. The problem we encounter is that there is not enough room to put new metal drawer slides on the sides of the old drawers or on the bottom. This means that new ones must be built. Oftentimes there are special rollers on the drawers that have broken and are not available anymore. In such cases you may have to get innovative and try to reconstruct the broken parts. Many of the older decorative real wood faces were made with rabbit or dado joints as a part of the actual drawer. With some creativity, you may come up with some ideas for remodeling the drawers by salvaging the existing fronts. Just remember this, old-time finish carpenters used plenty of glue when they fabricated kitchen and bathroom cupboards. If you start to disassemble things that you would like to reuse, be cautious because the glue bond is still extremely strong even though it may be very old. Upgrading existing cabinet doors by adding decorative trim molding is fun and an inexpensive way to make an old set of kitchen cabinet doors look great. After adding the special trim pieces, paint the doors on both sides. This idea works on plastic laminate and real wood doors. If you are a good free hand artist consider painting a few details on the cupboard doors. Butterflies, flowers or fruit images will all work just fine. You can also purchase stencils from art supply centers that have creative designs. Stencil painting cabinet doors is fun and rather simple to do. We used to do this particular fast kitchen cabinet remodel on many homes for a Realtor we worked for. Take all of the doors off, measure for new ones order white Thermofoil doors. Spray, brush or roll the interior and exterior of the cabinets with white cabinet rescue paint. Install the new doors, hinges and knobs. Voila! You now have a completely remodeled set of kitchen cabinets that cost under three thousand dollars to complete. You may have to build all new drawers. This is also a great way to renovate Formica Bathroom Cabinets. This is one of the more popular things elderly people do to make their kitchen cabinets more functional. Depending upon how many drawers you need this remodeling idea could cost anywhere from two to eight hundred dollars. A good rule of thumb to follow is each drawer will cost about seventy five dollars, installed. Usually there’s a minimum charge that accompanies smaller projects. Installing under cabinet puck lights is an affordable way to add a depth of elegance to your kitchen cabinet design. This is a very simple task. How hard is it to install under-cabinet Halogen lights? Not difficult at all. A drill, hole saw, a few bits and a screw driver or two will get the job done in a few hours. There are many different kinds of Lazy Susans that may work with your cabinet designs. Pull-out wire baskets, trash cans and even laundry hampers for the bathrooms are additional options to consider. There are hundreds of creative ways of remodeling a set of old kitchen or bathroom cabinets. 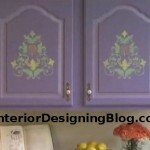 Faux painting or making glass cabinet doors are are other great ideas for making older cupboards look better. Much of what you decide to do will obviously be determined by your budget. Another thing that must be considered with every remolding project is the resale value of your home. Unless renovating old homes is your hobby and money is not an object, you should seriously consider the amount of money you are sinking into your kitchen or bathroom cabinetry changes.